(ORANGE, Calif., March 27, 2018) – CHOC Children’s leaders joined with mental health supporters today to celebrate the completion of the pediatric health care system’s Mental Health Inpatient Center, an innovative facility that fills a gap in a long-fragmented system that left children younger than 12 with no inpatient services in Orange County. Set to open in April, the 12,000-square foot, 18-bed facility will be the only one in Orange County to treat patients younger than 12. Further, it is the only facility in California to offer all private rooms, as well as an option for parents to stay overnight with their children, as appropriate. 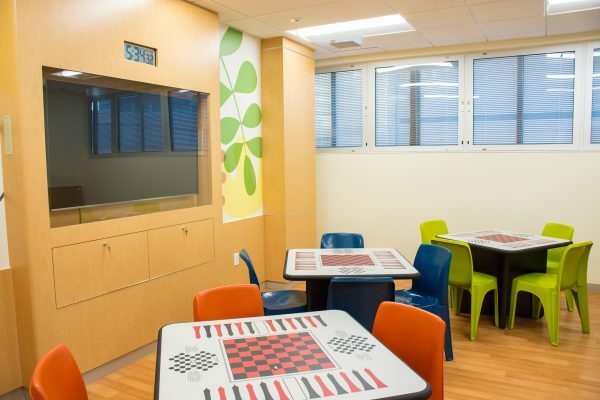 The Center’s other unique features include two sensory rooms – one sensory-rich and the other low-stimulation to help children learn to manage strong emotions and calm themselves. In addition, the facility includes a 3,600-square-foot outdoor play area with sensory activities and basketball court. The Center’s innovative floor plan was designed with guidance from national experts and incorporates elements of several exemplary programs observed by CHOC staff. It was built with two primary goals in mind: patient safety and creating an optimal healing environment. To that end, the facility incorporates safety features such as shatterproof glass, special high-density materials, doors that open one at a time, and many other measures. Meanwhile, the Center’s design includes elements of nature, curved features and a soothing color palette to promote healing and relaxation. With Dr. Hoang “Wayne” D. Nguyen as its medical director, the Center will serve patients ages 3 to 17, with specialty programming available to children 12 and younger. Patients will participate in therapeutic programming seven days a week, which is unique among inpatient facilities. During their stay, typically five to seven days, patients will also have access to medical specialists if assessments suggest a relationship between the mental health condition and an underlying health issue. CHOC broke ground on the Center, housed on the third floor of its research building, in September 2016. Plans for the Center were announced in May 2015 as the centerpiece of a pediatric system of mental health care that would be scalable and replicable by other health systems nationwide. Indeed, one in five children experience a diagnosable mental health condition during childhood — about 150,000 children in Orange County alone. Previously, the absence of designated space to treat young patients and a shortage of beds for adolescents in Orange County meant that often children with serious mental health episodes remained in emergency departments for days at a time waiting for a bed in an outside county. The total cost to build the CHOC Children’s Mental Health Inpatient Center was $13.2 million, with funding comprised of individual philanthropy, government funding and grants. Lead gifts were provided by children’s advocate Sandy Segerstrom Daniels and the From My Heart/Sharon D. Lund Foundation.